Technically, the Scottish Whisky Regions are defined by the Scotch Whisky Regulations 2009 which amongst other things, sets out the boundaries for the Regions. Though this has been enshrined in British and EU law for 8 years now, it doesn't appear that the industry as a whole has fully accepted all the geographical implications. I have reproduced the relevant part of the Regulations in the side panel, below right. The Regulations were drawn up in conjunction with the Scotch Whisky Association (SWA). ​In general the "localities" are still referred to as regions and the Islands other than Islay are often grouped together as well. The Regulations therefore only specify two boundaries between Regions. Traditionally maps have shown the Speyside Region to be a roughly square block carved inland from the Moray Firth coast. The regulations have defined the area geographically to coincide with local government boundaries. The Speyside area covers all of Moray Council area, plus the Badenoch and Strathspey ward of the Highland Council area. Without the latter, Tormore and Balmenach would have been excluded from Speyside. This gives the region a long tail following the Spey. The consequence of this definition is the inclusion of Speyside Distillery in the Speyside Region, and the exclusion of Aberdeenshire distilleries, such as Glendronach and Glen Deveron. But this also means that Dalwhinnie is now officially a Speyside distillery. Despite the fact that for 20 years Diageo have been promoting Dalwhinnie as the Highland Malt from the Classic Malts range. (The original six were: Highland - Dalwhinnie; West Highland - Oban; Speyside - Cragganmore; Lowland - Glenkinchie; Islay - Lagavulin and Islands - Talisker). ​The current line, as defined in the Regulations (right) is also from Greenock to Dundee, but is in two distinct parts, straight lines in the west, and following rivers and roads in the east. This fairly precise definition for the sole purposes of the whisky industry contrasts sharply with the equally precise but adherence to specific political boundaries at a specific date.used for the Speyside boundary. Do Regions matter anymore, anyway? Wayback, there was different legislation covering Highland and Lowland whisky, so it did matter. 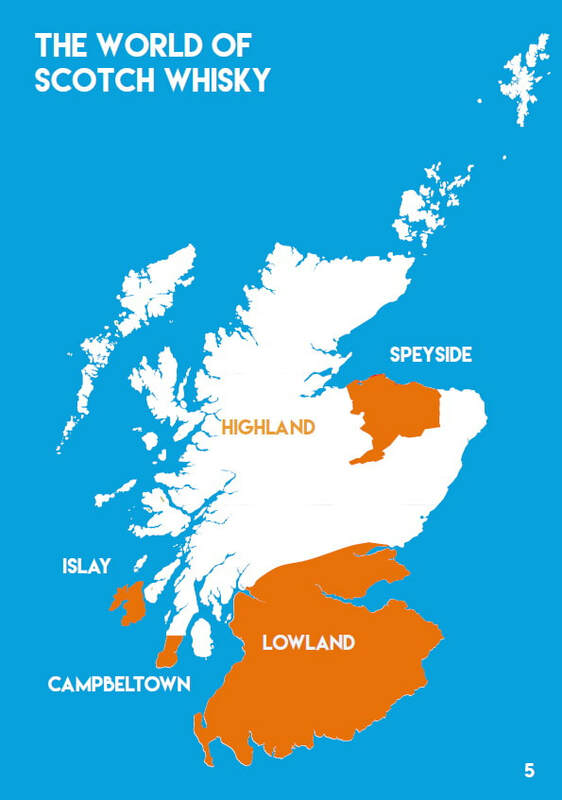 More recently, there was a view that Regions had specific characteristics, but not all Islay malt is peated; not all Lowland and Speyside malt is unpeated. How can anyone seek to define a Regional taste profile that includes eg a heavily-sherried Glenfarclas and a light delicate Tomintoul? Maybe they are useful in defining geographical areas, but the Highland Region is so geographically diverse as to make that fairly meaningless. Indeed when you consider any borderline distilleries, the lines sometimes seem to have been drawn to artificially include/exclude certain distilleries on an historical basis - but not always so as discussed earlier with regard to some Aberdeenshire distilleries. Despite the Regulations, I have not reorganised the site to confirm to them, and have subdivided the larger Regions as shown below. The boundaries of the 'localities' are fairly obvious, but I have added descriptions to the sub-divisions mentioned above. ​(b) “Islay”, comprising the Isle of Islay in Argyll. (ii) the Badenoch and Strathspey ward of the Highland Council as that ward is constituted in the Highland (Electoral Arrangements) Order 2006(c). (7) In this regulation “the line dividing the Highland region from the Lowland region” means the line beginning at the North Channel and running along the southern foreshore of the Firth of Clyde to Greenock, and from there to Cardross Station, then eastwards in a straight line to the summit of Earl’s Seat in the Campsie Fells, and then eastwards in a straight line to the Wallace Monument, and from there eastwards along the line of the B998 and A91 roads until the A91 meets the M90 road at Milnathort, and then along the M90 northwards until the Bridge of Earn, and then along the River Earn until its confluence with the River Tay, and then along the southern foreshore of that river and the Firth of Tay until it comes to the North Sea. As indicated above, the Scotch Whisky Association helped draw up the Regulations. However, they don't seem to have taken the implications of the regulations to heart on their website. The interactive map on their website, shows Auchentoshan on the Highland/Lowland border, and Glengoyne well within the Highlands Region. Speyside is still shown in the traditional rectangle with Dalwhinnie firmly in Highlands rather than its new Speyside home. They include a downloadable booklet SWA - Questions & Answers 2017, which defines Lowland whisky as being "made south of an imaginary line from the River Tay in the east to the River Clyde in the west." The artist given the brief of drawing a map for page 5, certainly used their imagination... The link to this page from their list of publications states: "The Scotch Whisky Association's publication answering frequently asked questions in relation to the industry, and in accordance with the Scotch Whisky Regulations 2009."